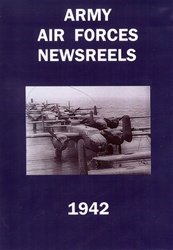 Army Air Forces Newreels 1942 DVD contains AAF-related newsreels from 1942 during the height of WWII. Description: First films of Jap attack on Pearl Harbor. B-17 dawn patrol over Hawaii. Pursuit Squadron P-40s guard the air over Hawaii. A secret P-39 base in Australia. US Army teaches advanced glider training. Gunnery school includes ball turrets. Air Chief Gen. Arnold receives honorary degree at Ohio Wesleyan. Ferry Command rushes bombers to Britain. Churchill thrilled by US military might. Thrill from National Air Races. Panama Canal well guarded. US bombers in Jap attack. Aviation mass bomber production. Rolls Royce powered Warhawk. Jimmy Doolittle tells all about "Shangri-La". Flying Tigers battle Japs in China skies. Victory at Midway. These Gals keep'em flying. US aces somewhere in Britain. First bombing mission to Rome. In the shadow of St. Paul's. Liberators blast Benghzai, Libya. First mission to bomb Europe. Captain Eddie Rickenbacker visits his old squadron, the 94th Pursuit. Eagles quit RAF to fly with Yanks. Jap attack on Dutch Harbor, Aleutians. Day and night RAF Bostons make Nazis take it. 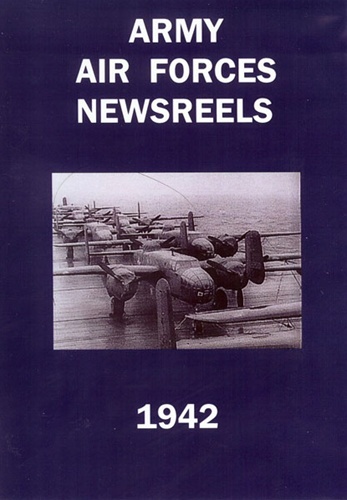 Total run time for Army Air Forces Newreels 1942 DVD is about 140 minutes in B7W. Format is NTSC DVD and Region-Free.